...LCCIL empowers people with disabilities to lead self-directed lives as valued members of the community. Lake County Center for Independent Living, serving Lake and McHenry counties, is a not-for-profit, disability rights organization. We exist to ensure that all people with disabilities have the tools they need to live independently. Governed and staffed by a majority of people with disabilities, we are a consumer-controlled organization, which means the services we provide are those chosen by our consumers. To learn more, click our ABOUT US page. For a list of positions, check out the Employment Opportunities page. We would like to extend our gratitude to everyone who helped make our sold out Trivia Night a success! Our sponsors, our donors and volunteers! And finally a big thanks to the participants who played on a team! Thank you for your donations in the purchase of your tickets and silent auction items! 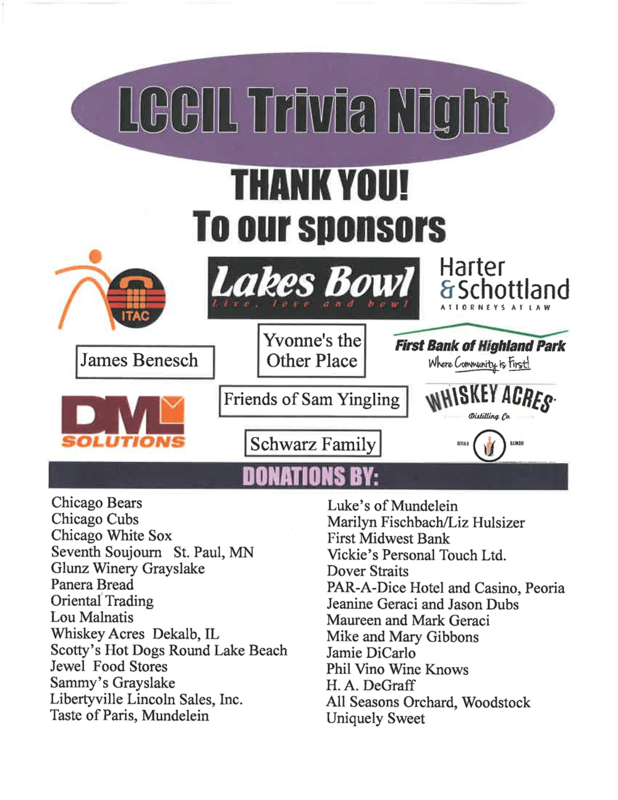 Through your participation, sponsorships and donations, LCCIL will be able to provide much needed services for more individuals with disabilities! In 1960, had one person from each polling place voted differently, Richard Nixon, not John F. Kennedy, would have been elected president. More recently, in the last election, the mayor of Mundelein won by only three votes! Do you ever wonder why one neighborhood gets passed over for things it needs, while another seems to get it all? Vote for the person who will represent you. This is how change is made. It took many votes to elect officials who championed civil rights. Voting is our chance to make a difference in our lives and throughout the world. We often voice our concerns, but if we aren't voting, our concerns won't matter. Voting gives you the credibility to make your issues a priority to legislators. Research the Candidates and Issues! Local newspapers are a great source of information as the election approaches. Take a look at the editorial sections that feature candidates from different races and discuss issues that will be on the ballot. Another way you can learn about a candidate is by contacting their campaign office. Ask any questions you have to know where the candidate stands on issues you care about.